Legacy Christian Academy will launch the Bring Your Own Device (BYOD) Program for the 2016-17 school year. Legacy is committed to creating a 21st century learning environment for all students. Laptops have been used to support and equip students with the tools and skills necessary for cooperative learning experiences, active problem solving, and enhanced communication with peers and teachers. Through the use of laptops, students are able to create products of real-world value. Students participate in forums, interact with online curriculum resources, and create original presentations and products to demonstrate their understanding. All of these opportunities are preparing students for academic success both now and in the future. With all of that in mind, it has been determined that providing (school-owned) computers for our students is not in the best interest of either the school or the families that send their children here. The laptops are becoming more and more personalized as students take ownership of the device in furthering their education. Additionally, parents are increasingly looking for more control over the various aspects of the learning tool as well as asking about the viability of using alternate platforms (Windows or Linux-based). Furthermore, LCA spends considerable resources maintaining the program, both through our time and our finances (much more so than the technology fee covers). We feel that we can be greater stewards of these resources by focusing our time and energy on the educational opportunities available to us through the use of technology, rather than simply maintaining the technology itself. It is with these thoughts in mind that, starting fall of 2016, all students in grades 7-12 will be required to bring their own laptop. We understand that there may be many questions about the program and we want to be able to answer them in a timely and efficient manner. Many of your questions may be answered through our Frequently Asked Questions and/or Minimum Requirements page. If you still have questions, please contact Michael Wiens in the Technology Department. * Accessing the internet through 3G, 4G, or “hotspots” while at school is prohibited. The computer must be able to access and utilize the school’s wi-fi network. This allows us to filter content and be assured of a minimum connectivity level. What will happen to the laptops that the students currently use? Students in grades 7-11 will have the option of purchasing the computer that they are currently assigned at the end of the school year. The price will be based on the current market value of the laptop. Purchase price will include laptop, power charger, and protective case. What happens to the technology fee? 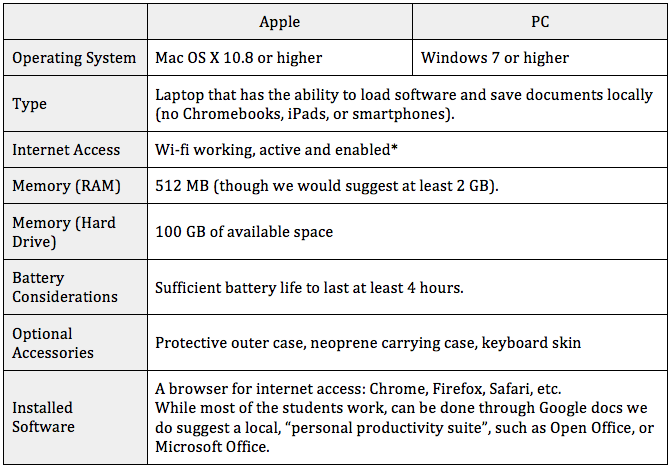 The current technology fee covers only part of the laptop lease. The rest goes to improve the other technologies and infrastructure within our building. However, we at Legacy understand the difficulties that may be associated with additional costs to families having to purchase laptop(s) for the upcoming school year. Therefore we will be discontinuing the technology fee starting with the 2016-17 school year. How did you decide to go with the BYOD program? The Legacy Christian Academy Technology Committee has been looking at options to either replace or extend the current 1 to 1 program since the beginning of the 2014-15 school year. After looking at the options in light of our school, where we are at and what we stand for, this is the direction that we have decided to go in. Why does it need to be a laptop (as opposed to a tablet or chromebook)? Many of our classes use software that can’t be replicated with a tablet or Google specific app. Some examples include: software used in yearbook editing, curriculum resources, graphic design, photo editing, STEM-Physics and presentation tools. Additionally, laptops give our students the option of saving their work locally and are not contingent on wi-fi. What kind of support will Legacy offer, if my student’s laptop doesn’t work? The Technology Department at Legacy will certainly be available to take a look at any student’s system that isn’t working properly. Ultimately, however, the condition of the laptop is the family’s responsibility. We will do an initial assessment and if the issue can get resolved within 15 minutes, and would not in any way potentially damage the machine further, we will do so. If the problem persists, the student will be given a loaner computer for up to one week, while his/her computer is being fixed. *** We highly recommend that all students purchase some form of insurance, and/or extended warranty in case of malfunction.